In front of a sold-out Agganis Arena, BU dropped a 4-1 decision to BC in the first game of a home-and-home series. The teams meet again tonight at Conte Forum with puck drop set for 7 p.m. The game will air live on ESPN3. Terriers dominated the first period, emerging with a 1-0 lead on Chad Krys’s power-play goal, following slick passes from Shane Bowers and Joel Farabee. BU had several chances to extend the lead, but was foiled by the Eagles Joe Woll, while Jake Oettinger defended a breakaway by Oliver Wahlstrom. BC tied the score midway through the second period on the first of Logan Hutsko’s two goals. A key turning point came minutes later with BU on the power play. Woll made a point-blank stop on Max Willman and Patrick Curry’s follow-up attempt went over a half-empty cage. Hutsko scored the eventual game-winner late in the period, beating Oettinger from the right circle. 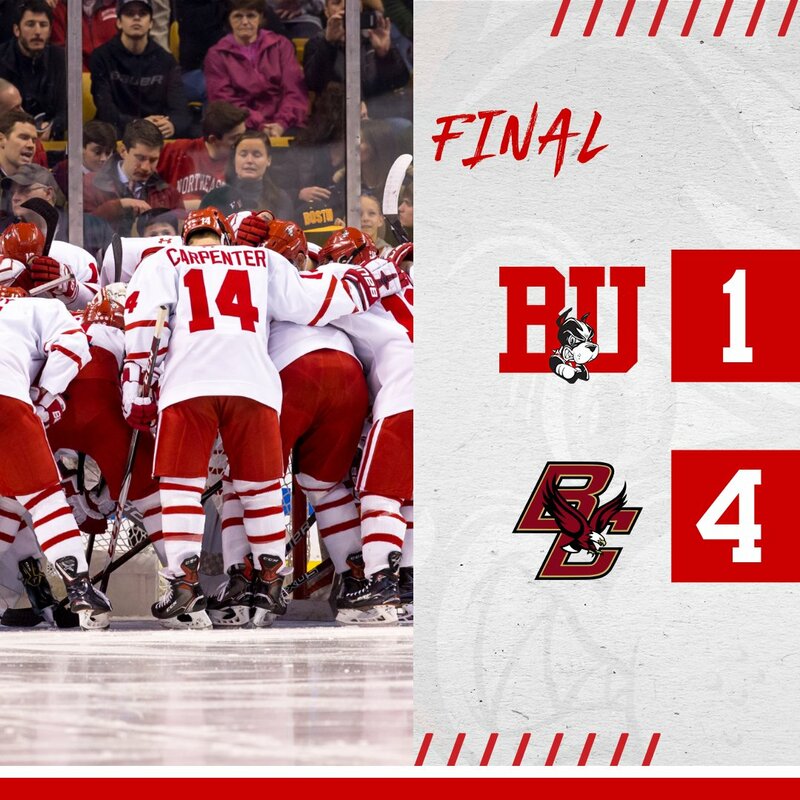 In the third period, BC severely limited the number of grade A scoring opportunities for BU and added an insurance goal by Chris Brown, followed by Marc McLaughlin’s empty-netter for a 4-1 final. Oettinger stopped 27 BC shots while his counterpart, Woll, stopped 38 Terrier shots. Among the few bright spots for BU was co-captain Bobo Carpenter’s strong performance in the faceoff circle—especially in the first period—winning 17 of 26 draws. 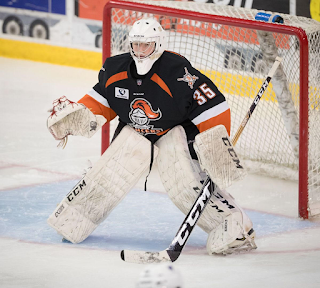 2019 recruit Vinnie Purpura stopped 19 shots in USHL Youngstown’s 3-2 overtime win against Fargo. In three starts since being traded to the Phantoms by Omaha, Purpura has a 1.96 GA and a .912 save percentage. 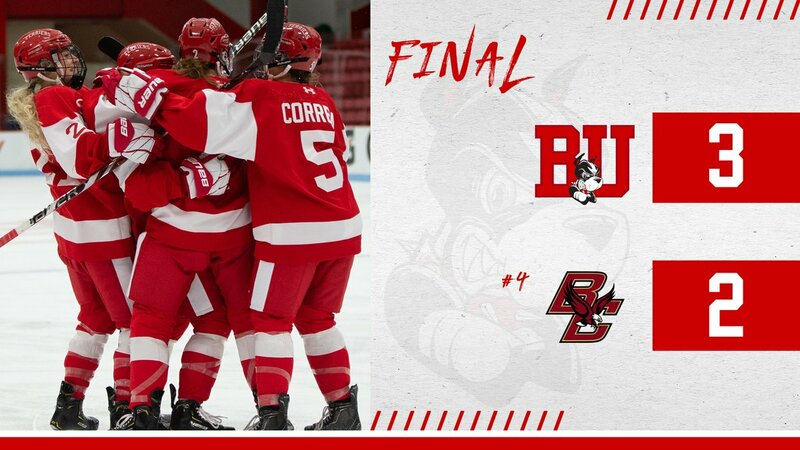 Behind freshman goalie Kate Stuart’s 42 saves and three power-play goals, BU upset #4 Boston College, 3-2, at Conte Forum. Nara Elia’s goal gave BU a first-period 1-0 lead that the Eagles would match in the second period. Freshman Emma Wuthrich scored her first goal early in the third. Then Jesse Compher scored the eventual game-winner late in the third to stretch the lead to 3-1 before BC cut the margin to one.